Starring: Johnny Depp, Michelle Pfeiffer, Helena Bohnam Carter, Eva Green, Jackie Earle Haley, Jonny Lee Miller, Bella Heathcote, Chloë Grace Moretz, Gulliver McGrath, Ray Shirley, Christopher Lee, Alice Cooper, Jonathan Frid, and more. 1) Acting - Total Thumbs Up: As actor Johnny Depp does in all things, he puts his own spin into his version of Barnabas Collins. Eva Green was a delicious Angelique. The love/hate/lust relationship between the two main characters was a lot of fun to watch. Michelle Pfeiffer was both the strong head of the Collins family and a little crazy with her huge macramé collection. All the supporting cast did a great job as well. The little touches from Ray Shirley as Mrs. Johnson were hilarious. 2) Special Effects - Total Thumbs Up: The special effects in this film were superb! Those used for the interior of Collinwood Manor towards the end of the film were utterly fantastic. Between the animated wood carvings and Angelique's skin cracking and her interior void, that whole set of scenes was mesmerizing. 3) Plot/Story - Thumbs Up: Though the script is slanted towards comedy, John August and Seth Graham-Smith are obviously fans of the original TV series. Not only are just about all the characters from the first season of Dark Shadows represented in the film, but most also closely resemble their original counterparts. Several lines used in the film even came straight from the TV show. There are plenty of 'in-jokes' for the fans of the series to enjoy. The largest changes in the story are to the character of Barnabas himself. Unlike the original, the film's Barnabas doesn't assimilate information on the 20th century over a days' time from his thrall Loomis. Instead, the film's Barnabas must contend and realize the differences between his way of life in the 1800's and the technologically and socially advanced lifestyle of the 1970's. The majority of the humor sprinkled through the film ties to this change. Barnabas was also made to look like a vampire regardless of whether it was day or night. His claws and the dark circles around his eyes were a giveaway that he wasn't exactly normal. The Barnabas of the TV series had a less difficult time hiding his true nature and could easily pass as a normal human. And while some of the small details were changed (for example the film's Barnabas didn't get cursed until after his parents' death, while in the TV series his father had been aware of his vampirism and hated him for it), the overall arcs from the original remain the same. Several plot arcs used in the TV series are thrown into this much shorter venue, so there are ghosts, witches, vampires, and werewolves in the mix. 4) Locations/Cinematography - Total Thumbs Up: Though the actual filming location were all in the UK, the creation of a Maine like locale was excellent. Collinsport not only looked like a Maine fishing town, but looked like a 1970's Maine fishing town. Collinwood Manor itself was amazing. The secret rooms and compartments were fun and ingenious. The manor entrance and main rooms were fabulous with gorgeous wood decorations. And the little touches of real life touching these rooms and the contrast to the bedrooms which were styled to the tastes of those using them were genius. 5) Costuming/Makeup - Total Thumbs Up: The clothes and makeup for the 1970's were excellently done. The back story segments also looked correct for the period. Conclusion: This was a fun film with a lot for new and old fans to enjoy. For older viewers it will be an awesome trip down memory lane, whether they ever saw the original series or not. Also, listen for the original theme, it's there - and so are shots of waves crashing into the rocks, a Dark Shadows' trademark. Just saw it last night with a couple of friends (we were all teenage fans of the original show) and it was delightful. Had to let go of my attachment to the original and go along with this campy, tongue-in-cheek interpretation, but once I did that, I had a grand time. 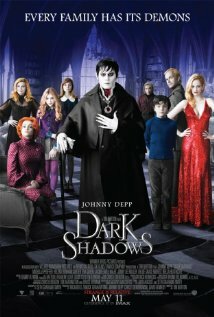 Johnny Depp's interpretation of Barnabas was, of course, as rich and satisfying as chocolate. And seeing Alice Cooper was uncanny. A thoroughly enjoyable experience. Glad you enjoyed it. I'd had some fears but the film came through. And I was so happy they put a good budget for the special effects. :) Yeah, the whole Alice Cooper thing felt so weird. lol. And yeah,hubby and I were about the same. We'd seen it eons ago and I remembered just enough for the nostalgia to hit full force. We went home after the movie and watched several episodes from 1st season on Netflix. heh heh. That's how I caught the fact they quoted a few lines straight or close to straight from the show. I'm pretty sure they threw the werewolf bit in because it becomes a plot point later in the series. Cramming 5 years of TV plots into one movie must have been daunting. lol. And we loved, loved, loved the special effects on the house toward the end. Glad you enjoyed it!